Scoliosis occurs relatively frequently in the general population, and its frequency depends upon the magnitude of the curve being described. 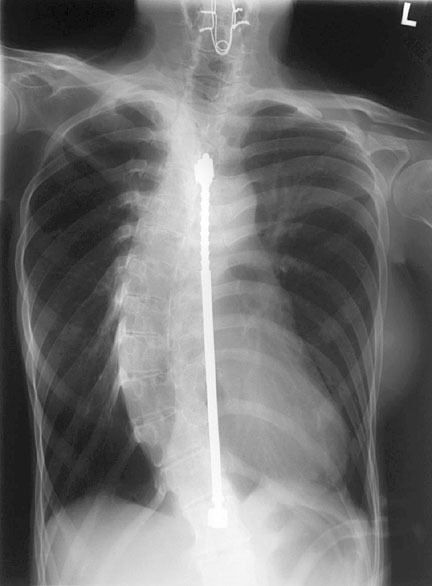 Scoliosis of greater than 25 degrees has been reported in about 1.5/1000 persons in the United States. Most curves can be treated nonoperatively if they are detected before they become too severe. However, 60 % of curvatures in rapidly growing prepubertal children will progress. Therefore, scoliosis screening is done in schools across America and several other countries. This screening is probably not necessary until the fifth grade. Beyond that point, boys and girls should be examined every 6 – 9 months. Generally, curvatures less than 30 degrees will not progress after the child is skeletally mature. Once this has been established, scoliosis screening and monitoring can usually be stopped. However, with greater curvatures, the curvature may progress at about 1 degree per year in adults. In this population, monitoring should be continued. If scoliosis is neglected, the curves may progress dramatically, creating significant physical deformity and even cardiopulmonary problems with especially severe curves. Currently, scoliosis is treated successfully by special braces, electrical stimulation, surgery, or by combinations of these three techniques. Generally, scoliosis is treated by orthopedic surgeons with special training in spinal problems. However, radiographic scoliosis examinations are ordered by a wide variety of other physicians, most of whom look toward the radiologist as the local musculoskeletal expert, after the orthopedist. Therefore, one must know how to read these films and how to dictate a coherent and helpful interpretation of them. Standing AP and lateral views of the entire spine demonstrate an arcuate thoracolumbar scoliosis with a rightward convexity. No associated vertebral abnormalities are noted. Using the Cobb technique, and measuring from the top of the T9 and the bottom of the L3 vertebral bodies, this angle measures approximately 27 degrees. The apex of the curve is at the T12 vertebral body and demonstrates grade 3 out of 4 rotation to the right. Lateral bending films show persistence of the curvature with bending to the right and increased curvature with bending to the left. This indicates that the thoracolumbar curve is structural and major. The iliac apophyses are complete along the iliac crests, but have not yet fused with the ilium, indicating that the patient has not yet reached skeletal maturity. The remainder of this chapter will discuss the rationale behind each of the parts of this sample dictation. The normal thoracolumbar spine is relatively straight in the sagittal plane and has a double curve in the coronal plane. As shown below, the thoracic spine in convex posteriorly (kyphosis) and the lumbar spine is convex anteriorly (lordosis). Normally there should be no lateral curvature of the spine. Scoliosis is a complicated deformity that is characterized by both lateral curvature and vertebral rotation. As the disease progresses, the vertebrae and spinous processes in the area of the major curve rotate toward the concavity of the curve. On the concave side of the curve, the ribs are close together. On the convex side, they are widely separated. As the vertebral bodies rotate, the spinous processes deviate more and more to the concave side and the ribs follow the rotation of the vertebrae. The posterior ribs on the convex side are pushed posteriorly, causing the characteristic rib hump seen in thoracic scoliosis. The anterior ribs on the concave side are pushed anteriorly. Scoliosis also causes pathologic changes in the vertebral bodies and intervertebral discs, as shown below. Idiopathic genetic scoliosis accounts for about 80 % of all cases of the disorder, and has a strong female predilection (7:1). It can be subclassified into infantile, juvenile and adolescent types, depending upon the age of onset. The most common of these is adolescent scoliosis, which by itself is by far the most common type of idiopathic scoliosis in the United States. Scoliosis can result from congenital vertebral anomalies, as shown below. Discovery of these anomalies should prompt a workup for other associated cardiac, genitourinary or vertebral anomalies. Other causes of scoliosis are occasionally seen, especially due to trauma, neurofibromatosis or associated with one of the neuromuscular disorders. The radiographic assessment of the scoliosis patient begins with erect anteroposterior and lateral views of the entire spine (occiput to sacrum). In addition, the examination should include a lateral view of the lumbar spine to look for the presence of spondylolysis or spondylolisthesis (prevalence in the general population is about 5 %). The scoliotic curve is then measured from the AP view. The most commonly used method (used by the Scoliosis Research Society, the U. S. Air Force, and everyone I’ve ever worked with) is the Cobb method. The Cobb method has several advantages over other methods, including the fact that it is more likely to be consistent even when the patient is measured by several different examiners. An alternative system, known as the Risser-Ferguson method, is used far less commonly. One must first determine what type of curvature is present. The curvature may be acute, such as seen with a fracture or hemivertebra. More often, it is smooth and arcuate, as shown below. The presence of any vertebral or rib anomalies should be reported. Scoliosis is generally described as to the location of the curve or curves, as shown below. One should also describe whether the convexity of the curve points to the right or left. If there is a double curve, each curve must be described and measured. To use the Cobb method, one must first decide which vertebrae are the end-vertebrae of the curve. These end-vertebrae are the vertebrae at the upper and lower limits of the curve which tilt most severely toward the concavity of the curve. Once these vertebrae have been selected, one then draws a line along the upper endplate of the upper body and along the lower endplate of the lower body as shown below. If the endplates cannot be easily seen, these lines can be drawn along the top or bottom or the pedicles. The angle of interest is simply the angle between these two lines. However, with minor degrees of scoliosis, these two lines will probably intersect off the film somewhere, like downtown Seattle. Therefore, a useful theorem from high school geometry is used to help measure this angle. If one constructs perpendicular lines to these first two lines, these perpendicular lines will intersect on the film and will have the same angle between them as exists between the first two lines. When reporting this angle, it is important to mention that one is using the Cobb method and also which end vertebrae were chosen for the measurement. This latter data is especially important, since once chosen, the same levels should be used from then on to measure curvature on follow-up films. This information should be in the radiographic report, since it becomes part of the patient’s chart and therefore lasts far longer than the radiographs, which are often recycled after 5 years or so. Once one has measured the angle of curvature, one may then estimate the degree of rotation of the vertebra at the apex of the curve by looking at the relation of the pedicles to midline. Prior to surgery, a set of lateral bending films are often taken to assess the rigidity or flexibility of the curves. In the illustration below, the thoracic curve is the major curve and the lumbar curve is simply a compensatory curvature. This is shown by the lateral bending films. A further goal of the radiographic examination is to determine the physiological or skeletal maturity of the patient. As mentioned above, once skeletal maturity has been reached, curvature below 30 degrees do not progress. Therefore, one may at this time consider discontinuing followup examinations in this population, and scoliosis screening in the general population of children. Several methods can be used to estimate skeletal maturity. A single AP view of the left hand and wrist can be compared to standards in the Greulich and Pyle hand atlas. Since the iliac crests are usually present on a scoliosis study, they provide a convenient index of skeletal maturity. When the iliac crest apophyses meet the sacroiliac junction and firmly seal to the ilium, maturation is nearly complete. One can also look for evidence of maturation in the vertebral bodies themselves at the endplates, as shown below. When the plates blend in with the vertebral bodies to form a solid union, maturation is complete.